이암필 의 작자인 이암(李巖, 1499∼? )은 세종대왕의 넷째 아들인 임영대군(臨瀛大君, 1418∼1469)의 증손으로서 자는 정중(靜仲)이며, 정5품의 두성령(杜城令)에 제수된 인물이다. 그는 영모화(翎毛畵)와 조화에 뛰어났다고 한다. 이 작품은 따스한 봄날 꽃나무를 배경으로 하여 세 마리 강아지가 한가롭게 햇볕을 즐기고 있는 장면을 그린 것이다. 굽어진 가지에는 두 마리의 새가 앉아 있는데, 이 새들은 서로 마주보고 있는 것이 아니라, 가지를 향해 날아오는 나비와 벌을 마치 호응하듯 바라보고 있다. 세 마리의 강아지는 〈모견도(母犬圖)〉(국립중앙박물관 소장)라는 이암의 다른 그림에서 이미 낯익은 강아지들이다. 이 중 누렁이는 앞발에다 얼굴을 괴고 단잠에 빠져 있으며, 어미를 빼어 닮은 검둥이는 무슨 소리를 들었는지 눈을 동그랗게 뜨고 오른쪽을 응시하고 있다. 한편, 화면 앞쪽의 흰둥이는 꼬리를 길게 늘이고 방아깨비를 잎에 문 채 장난을 치고 있다. 전체적으로 소재나 화면의 구성요소들이 너무나 자연스럽고 조화를 이루며 따스한 봄날의 평화로운 분위기가 보는 이에게 절로 전달되어 온다. 나무 밑과 화면 좌측 하단의 바위는 조선 초기에 즐겨 쓰여졌던 단선점준(短線點皴)으로 처리되어 있어 당시의 시대색을 반영한다. 그리고 화면 우측 상단에는 정(鼎)모양의 도장과 이암의 자(字)인 ‘정중(靜仲)’이라는 백문방인(白文方印)이 있다. 이 작품은 제작시기가 상당히 올라갈 뿐만 아니라 필자가 확실하고, 또한 조선시대 초·중기의 얼마 되지 않는 작품 가운데 독특하면서도 한국적 화풍을 뚜렷이 보여준다. This painting is by Yi Am (1499-? ), who was the great grandson of Prince Imyeong (1418-1469), the fourth son of King Sejong. Known also under his penname Jeongjung, Yi Am was bestowed the fifth rank title of Duseongnyeong by the king. As a literati painter, he is said to have excelled in fowl-and-animal and flower-and-bird paintings. This painting depicts a scene in which three puppies are basking in the spring sun against the backdrop of a blossomed tree. Two birds are perched on the sinuous branches, facing toward butterflies and bees approaching the tree, attracted by the blossoms, as though they were engaged in some form of communication with them. These same three puppies also appear in other paintings by Yi Am, such as ‘Mogyeondo (Mother Dog and Puppies, kept at the National Museum of Korea).’ The yellow one is sound asleep with its head resting on its front paws. The black one, having the same coat as the mother, is perking up, as though it heard a sound, with the eyes staring toward the right side. Finally, the white puppy in the foreground has its tail stretched out and is playing with a grasshopper loosely held in its mouth. The scene is very natural with all elements composing it fit perfectly the chosen subject, and the painting exudes the peaceful atmosphere of a warm spring day. The texture of the tree trunk and the rock at the bottom left of the painting is rendered with multiple dots; a technique popularly used in early Joseon paintings. 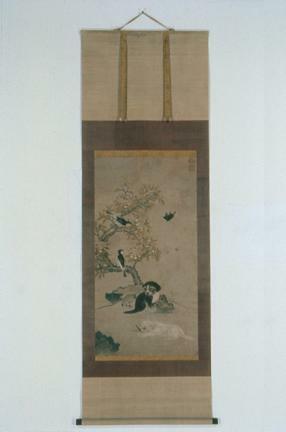 There is a seal in the shape of a tripod cauldron and a counter-relief seal of the artist’s penname “Jeongjung” at the top right of the painting. This painting is not only valuable for its age, but also because its author is clearly established. Yet more importantly, as one of the very few extant early to mid-Joseon paintings, this painting remains highly original, all the while displaying a very distinctly Korean flavor.